On November, the 17th 2017 Binary System has achieved the UNI EN ISO 9001:2015 Quality Certification with the aim of making the business organization more efficient and thus achieving a path in place since its foundation and will guide the company towards continuous improvement full customer satisfaction. 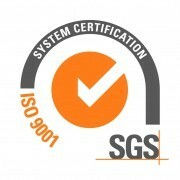 In a world where administrative and managerial transparency requirements tend to be translated with excessive formalization of procedures and increasing bureaucracy, Binary System has decided to put the individual at the center of attention, starting with the path that has led it to obtain the ISO 9001:2015 Quality Certification. The decision to certify Binary System is the result of a strongly shared choice, involving all the staff who wanted to put its work in the spotlight to test their actual incisiveness and appreciation by the customers. A long and laborious route that has tested the teamwork for nearly a year, calling each staff member to deal with its professionalism, with its skills and, in some cases, updating approaches and methodologies . Of course, the accuracy of internal workflow is crucial to proper management of resources and activities. But it is useless and ineffective if it make lose sight of the ultimate goal. And that goal is the real customer satisfaction. On the other hand, compliance with international standards set by the ISO standards allows the Binary System to have a kind of compass with which navigate along an arduous and rapidly evolving path, and above all it helps to always aim for the right direction: the constant improvement in customer interest. Having obtained the certification, then, is only the first seed thrown into the vast field of Quality. A seed that for sprouting has required so much care and attention, which has aroused enthusiasm and satisfaction to those who have carefully taken care of it and see it grow, but that requires just as much dedication as it has blossomed.